The brain begins as the ectoderm, which is the top layer of the now three-layered embryo, and will develop into the neural tube which will close by week six. At ten weeks gestation, the new brain will begin forming neurons at the rate of 250,000 per minute, according to the article “Fetal Development: What Happens During the First Trimester?” At the 16th week, the fetus’ eyes are becoming sensitive to light, and at week 18, the fetus can hear. By the 28th week, the fetus’ eyes open. According to the article “Early and Very Early Parenting” by William Sallenbach, PhD, as early as 1920, psychologists began studies involving prenatal learning. 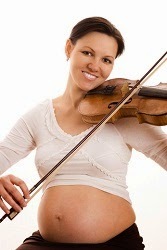 In a case study, prenatal learning was observed especially in the last trimester of pregnancy. By reading, singing, or even just talking to her unborn child, a mother begins their bonding experience early on. Research shows that fetuses even recognize their mothers’ voices when they hear it in the womb. These findings indicate “that in-utero experience has an impact on the newborn/infant behavior and development and that voice recognition may play a role in mother-infant attachment,” as noted by Barbara Kisilevsky in the article “Mothers Voice Triggers Fetus Heart Rate Increase” . At only week ten of gestation, a fetus’s neurons are forming at the rate of 250,000 per minute. By birth, a baby comes into his parents’ arms with about 100 billion neurons, each with about 10,000 branches! This is according to David Allen Walsh, PhD, in his book, /A Survival Guide to the Adolescent Brain for You and Your Teen/. IN UTERO is a cinematic rumination on what will emerge as the most provocative subject of the 21st Century – life in the womb and its lasting impact on human development, human behavior, and the state of the world. Epigenetics, Alice In Wonderland, The Matrix, scientists, psychologists and doctors converge to prove that we are not what we think we are. IN UTERO brings together for the first time convincing data that explains why some of us face challenges from the start while others thrive. Prepare to be surprised, intrigued, but no longer baffled by what the future holds for yourself, your loved ones, and the human race.